If you must assemble or analyze enterprise financial data, this hyperbook is for you. Dozens of tips, tricks tools and techniques. This is a course about using spreadsheets to manage enterprise data, from the perspective of a budget manager or a proposal manager. It emphasizes both spreadsheet design techniques and process management. That is, we're not only interested in building spreadsheets and macros to support the budget or proposal process, but we want to build them in ways that are easily managed, and that give reliable and cost-effective results. In the form of a stand-alone Web site, it has dozens of examples and tools. This is a stand-alone Web site available to download. Includes three months unlimited email support. 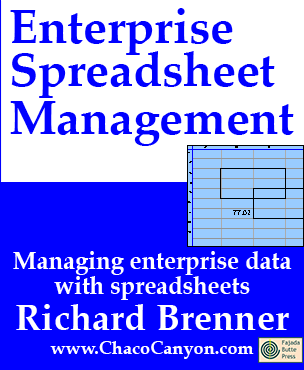 Enterprise Spreadsheet Management, downloadable hyperbook Edition has dozens of worked problems designed specifically to show you techniques for managing enterprise data using spreadsheets, specifically, Microsoft Excel. The goal always is to present examples that are simple enough to understand, that illustrate the points that are most essential to grasp, and yet to avoid the details that, while essential in "real life," can make learning difficult. The result is an invaluable resource for anyone who is responsible for designing or implementing tools for others to use in the modern enterprise.